Board directors Sarah Nguyen (chief information officer, left) and Chi Nguyen (president, right) interview via Facebook Live with life coach Quinton Carlin on his Self Developed Life podcast series about the Trek Relief startup story. Hear from Langtang Valley earthquake survivors about their struggles and how they have been able to get back on their feet thanks to generous international donors like you. Another fulfilling volunteer day complete! Cleared brush from site, began construction on first wall; 2.5 layers of stone masonry completed. Cleaned up trash on the trail, stunning and inspiring other trekkers and locals to follow suit. Distributed posters on waste management, now enthusiastically displayed at teahouses. The work will continue in our absence under the loving hands of the community members. As we reflect on an incredibly productive and fun adventure across the Mongolian plains this past summer, we have been excitedly finalizing the details of an improved itinerary for next year, which includes camelback rides through the stunning Gobi desert and tightening our relationship with the ever-inspirational and hospitable Mongolian Rotary Club of Khangarid. In short, this is going to be a fun-filled adventure encompassing environmental stewardship, fun social events in the city, and wild landscapes. Learn more about it and join us. Sarah Nguyen, CIO, on leading our pilot trip. Rob Williams, President, with a furry friend. We are so honored to have been chosen as this round's highlighted charity of a series of fundraising parties thrown by the Fishbowl community. Trek Relief alumni and friends stepped up to help run the event, while DJs, live performers, and bartenders kept the entertainment levels high. Who knew that raising money could be so much fun? A HUGE THANK YOU goes out once again to the amazing Fishbowl organizers. If you are also interested in hosting a fundraising event for Trek Relief and would like to connect with our multi-talented networks, feel free to send us a message! 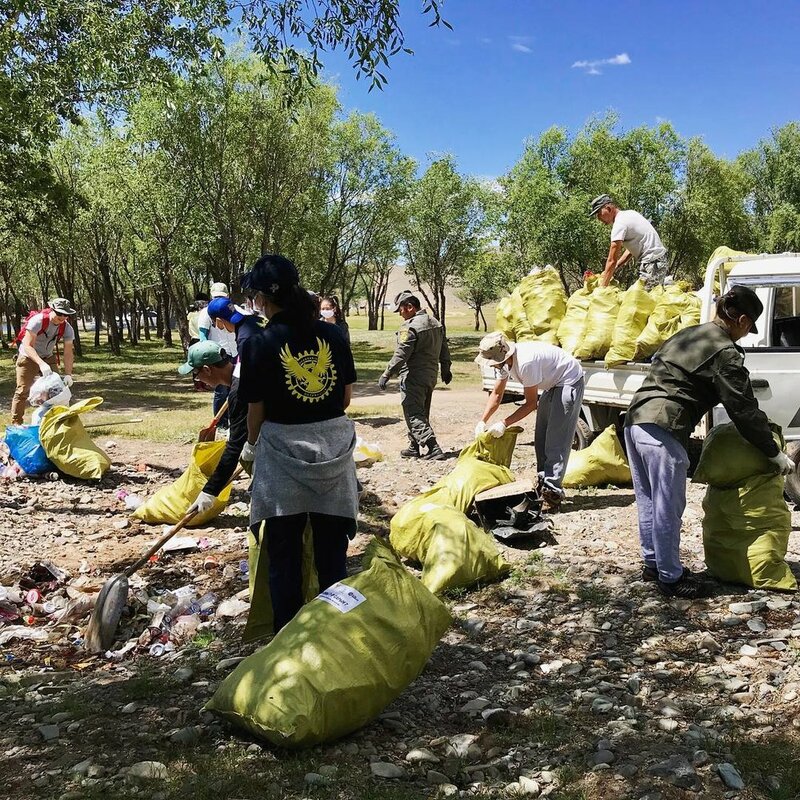 Trek Relief volunteers worked together with the Mongolian Rotary Club of Khangarid, Terelj National Park Rangers, and the local community to spread awareness and take action against littering in national parks. 27 local volunteers lent a hand and installed permanent trash cans in high traffic areas. To push our efforts further, we created and translated guidelines for Sustainable Travel and required our guiding staff to abide by them for our trips. By setting a working standard with our organization, it is our hope to not only educate the public sector's mindset about waste, but also do what we can to encourage the Mongolian tourism industry's budding approach to caring for the Earth. We're still reveling in the novelty of our shiny new nonprofit status, and we got another dose of excitement when we realized that our charity is registered on Amazon. Did you know that Amazon Smile donates 0.5% of anything you purchase to your charity of choice? All you have to do is shop like you would normally on Amazon, but make sure you use the domain smile.amazon.com instead! (5.) TIP: Google Chrome users can download this extension to be automatically redirected to smile.amazon.com. Go forth now, and #shopwithpurpose! We got our 501(c)3 determination letter - we're now a federally-recognized charitable nonprofit! The IRS accepted our application within the first submission, but that doesn't mean it was an easy process. 8 months of revisions, 5 months of waiting, and in the meantime launching 3 brand new projects - there was so much to write about! But finally, we can now do what we had set out to do - be more effective with our fundraising for causes we care about. Now it's time to REALLY fundraise - and there is so much to do! ...or any other fundraising possibility. Please write us a quick message if you'd like to help or have ideas to share! Our volunteers were on site to provide medical support to our rural health camp in the mountainous village before trekking to Everest Base Camp. Dr. Bimlesh Shah, head of Salyan PHC, expresses his gratitude for our contribution. Trek Relief provides jobs to local women; School Build Phase 1 complete! The ripple effect of the school build has caused many sources of joy for our team and locals alike. Our donors' funds have been providing jobs to women in a place with little opportunity for female employment. These women are preparing the aggregate needed for the foundations of our school. Phase 1 has been completed, and we're ready to start building walls! PARTY with Purpose Fundraiser Success! THANK YOU SO MUCH for coming, supporting, donating, bringing your friends and family, volunteering, leaving no trace, and being a part of our first official fundraiser!! It was such a breathtaking, fun, and magical night. This 100% volunteer-run event would not have been possible without you! We were absolutely blown away by everyone: from the talented performers, musicians, artists and fire spinners; to the setup crew, bar backs, breakdown, and clean up. All the little details truly add up. We came together to share our gifts and presence for a great cause. We hope you had an amazing time! 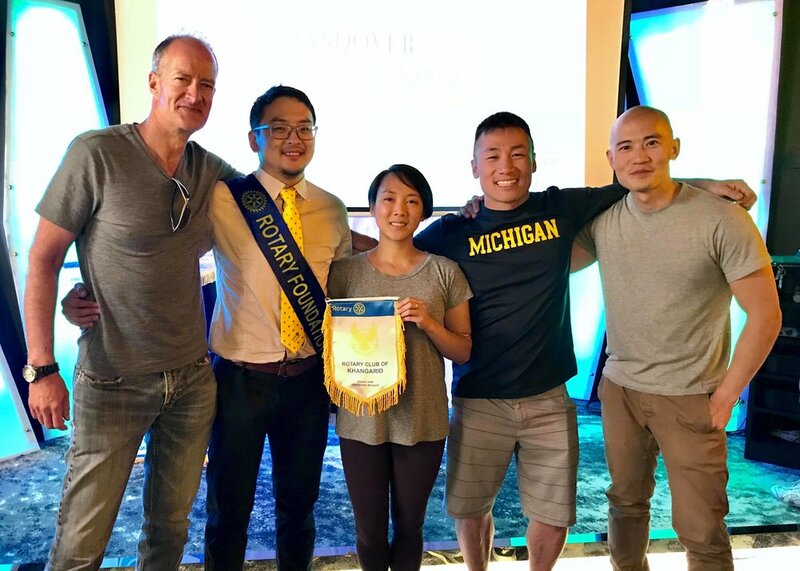 The winner of the raffle trip to Mongolia: Ran Kim! Congratulations!!! Art and silent auction winners - We will be notifying you with details and pick up info! If you have any questions, ideas, suggestions, or wish to support and get involved (in general or with the next fundraiser), please contact us. It's only going to get bigger and better. Thank you from the bottom of our hearts and on behalf of the communities in need we are helping. Namaste! We are really excited about the growing community involvement for the Komin Shyamey Wangphel Secondary School build at the gateway of Langtang Valley!! Buddha Gurung, our architect and earthquake-safe specialist, met with local officials, various political party leaders, the VDC chairman, school principal, and the school management committee this week in Syabrubesi to finalize the building contract. We have signed and stamped a document agreeing to sponsor the school build, while our architect provides technical supervision as the community manages the project within our budget to ensure quality construction. This is the best case scenario - we are funding a community-powered solution and allowing the local people to take ownership! We've come a long way since we discovered this school 9 months ago. After months of back and forth over time zones, language barriers, construction designs and budgets, we are happy to announce that phase I construction of the school has officially started!! Thank you to all our wonderful participants and supporters who have made this miracle a reality. HAPPY HOLIDAYS from the Trek Relief team. Namaste friends! If you don’t have the time in the near future to go on a 2-3 week trek through Nepal or Mongolia with Trek Relief, but still want to get involved or contribute in some way, shape, form? 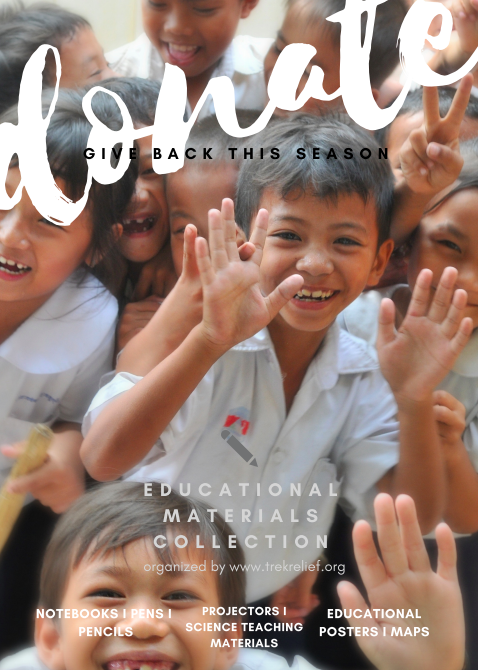 We are now holding an Educational Materials Drive for schools in Nepal. We have asked local school boards what their classrooms and students need, and they’ve listed the following materials: educational posters, maps, projectors, science teaching materials (magnifying glasses, rulers, stopwatches, etc. ), notebooks, pens, pencils, old laptops. If you’d like to donate any of the above, please let us know by emailing hello@trekrelief.org. Don’t feel limited to what is listed above — globes, inspirational educational decor, and more are welcome... anything you think would be of value in a classroom would be deeply appreciated by the educators, parents, and children of Nepal. Thank you!! We have been working with our Nepalese architect in preparation for the upcoming school build as we are just nearly done with clearing the rubble from site. 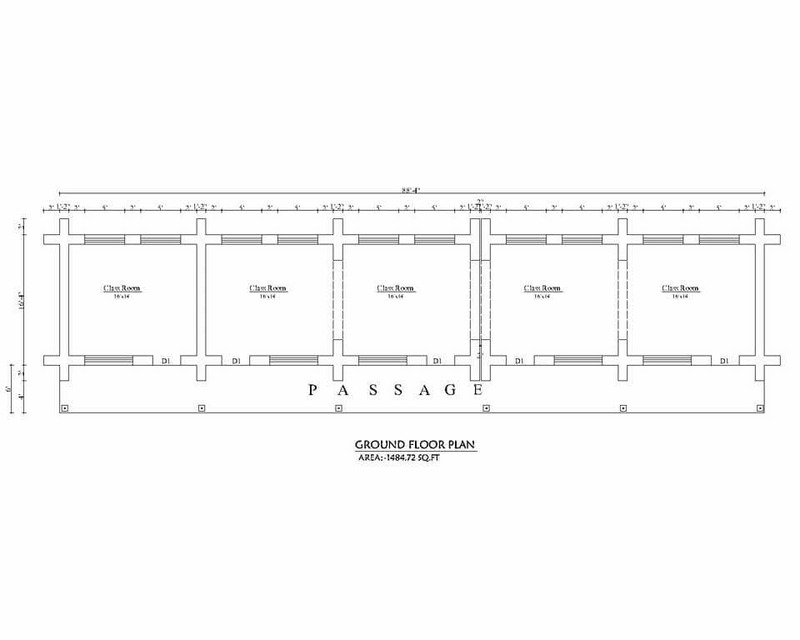 We will be building the school in four phases. Stay tuned for more updates!! Some of these buildings were rebuilt this year with the help of Trek Relief funds and volunteers. Thank you to everyone that contributed to these builds!! We appreciate every single donation and trek that made this all possible. Our architect from Kathmandu came out to the school site in Syabru Besi earlier this month to meet with us and some key school officials in Langtang Valley. After a series of meetings, the District Education officer Shukadev has agreed to grant us permission on condition that we enlist the help of the school committee to do the application for us. The school committee members have agreed to submit the paperwork for us after learning of the needs and requirements. By next year, the rubble should be cleared away and the site will be ready for building. We're starting a slow but steady construction progress with 3-4 workers. Labor costs about $10 per day. We also have to keep in mind that the summer monsoon season will put a little hamper on construction progress. We are currently in search of a long-term site manager who will translate the architectural blueprints into reality and direct the labor. In the next couple weeks, our architect will be giving us an overall budget for the school build with a detailed line-by-line breakdown of how much everything will cost. 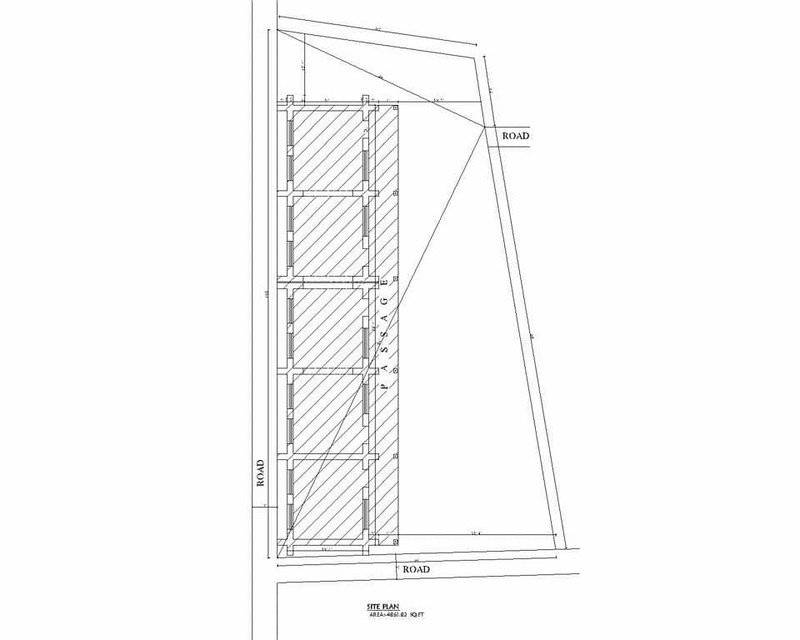 Our architect has agreed to be in charge of obtaining all the necessary paperwork, providing all architectural plans, and providing detailed costs for everything. He has agreed to find the best price for construction materials between Syabru Besi and Kathmandu, while school committee member Rishang has offered to help us find local labor. Binoy will be taking care of all payments and on-ground logistics while the site construction manager takes care of the actual school build. We will raise funds and bring volunteers!! On the latest trek, the unexpected snow led us to a new project that needs our help - a school rebuild at the bottom of Langtang Valley, at the trek starting point in Syabru Besi. We discovered this completely ruined school through the detour and learned that children as young as 3 years old are having to walk an hour uphill to the next closest school. 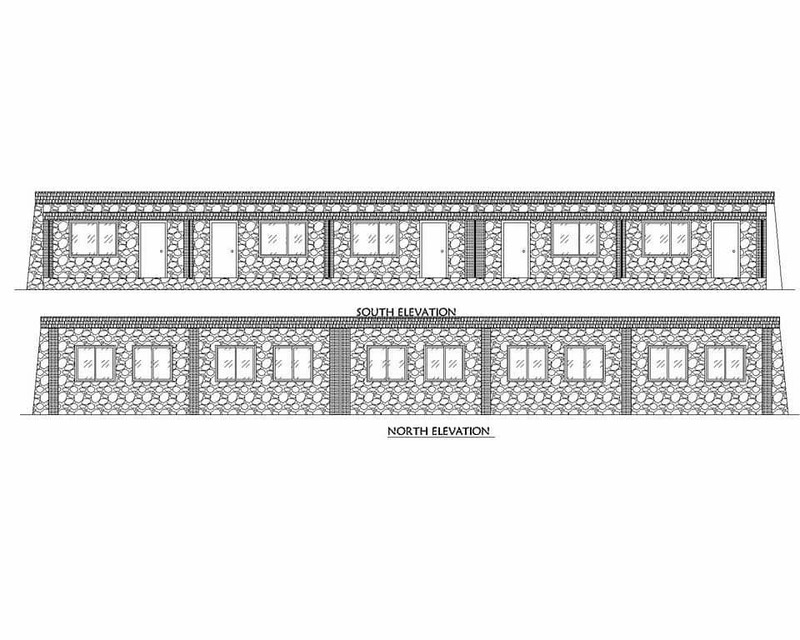 We are beyond excited to help piece this school back together and provide a space for these children to learn!! Below are before and after photos after just one day of volunteer work. Our volunteers removed a lot of the rubble, and we will likely have to demolish the remaining walls and foundation before rebuilding on the site again. We are currently meeting with the school principal, District Education Officer, local village officials and engineering consultants in order to complete the necessary permitting process required by the Nepalese government to meet earthquake-resistant standards before we translate the design into reality. "LMRC has provided 32.5 sacks of cements to all 116 families with transportation cost. 250kg of iron bar to all 116 families. 50 pieces of plywood to all 116 families. 6 pieces of floor plywood, glasses for window to all 116 families. all materials are transported to Langtang. All money are mixed and used for all 116 families. Cash Rs. 150000 was distributed to all 116 families. and soon Rs. 30000 will be distribute to all 116 families within next few weeks. In Kyanjin Gumba 17 lodges are rebuild, Sindum 1 lodges and 2 tea shops are rebuild. Yamphu 2 teashops are rebuild. Nespali 2 teashop are rebuild. Mundu 5 lodges are rebuild and 3 orphans home rebuild. Langtang 12 lodges are rebuild and three orphans home rebuild. Gumba 5 teashop with few rooms rebuild. Langtang one community building rebuild, Mundu one community hall rebuild. Kyanjin one community hall rebuild." Candice Young has stepped foot in 40 countries, including 27 since she graduated from UC Davis in 2011 with a degree in biological sciences. 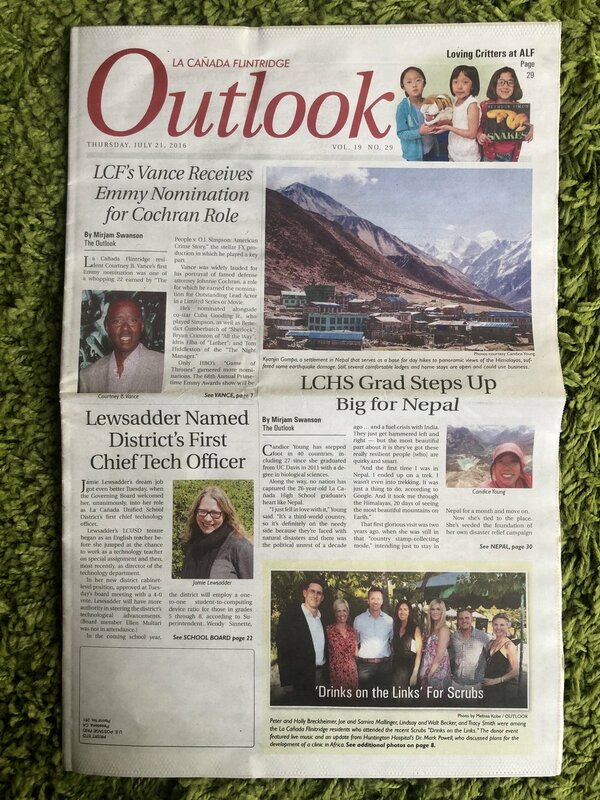 Along the way, no nation has captured the 26-year-old La Cañada High School graduate’s heart like Nepal. That first glorious visit was two years ago, when she was still in that “country stamp-collecting mode,” intending just to stay in Nepal for a month and move on.Now she’s tied to the place. She’s seeded the foundation of her own disaster relief campaign — Trek Relief for Langtang Valley, it’s called — in the South Asian nation. She’s working to collect funds to rebuild a valley that desperately needs help recovering from the deadly 7.8-magnitude earthquake in April 2015, but is getting scant attention. Within a few weeks, Candice Young was tapping into her experiences as a former president of the LCHS Key Club when she was named the program’s project coordinator. She oversaw more than 70 volunteers who, in three months’ time, built 50 homes, 52 toilets and rubbled hundreds of other homes. Young also was charged with making sure her team had enough fuel to reach its destinations — in the midst of a fuel crisis, an experience that made her appreciate being able to gas up in California in a new way. “That was my favorite part of the job,” Young said, describing a scene in which she, a young Chinese-American woman in the midst of an all-male Nepali crowd, would stand in front of large supply trucks at the fuel pumps, blocking their way to ensure her vehicles got enough fuel. The fuel station owner appreciated her pluck, she said, and he became a friend, regularly offering her chiyaa (milk tea) and donuts at his teashop each day. “Being able to look back on that situation, I feel like I can do anything now,” said Young, who is determined to help the Langtang people by directing tourists their way. She said families living in the valley relied on tourism for 90% of their income, but the earthquake — which killed nearly 9,000 people — decimated so much of the region that guides have stopped recommending the route, leading many to believe it’s no longer traversable. That’s not true, said Young, who began her trek through the region with what she describes as “intrepid curiosity” that in turn became an experience that left her “deeply unsettled.” She saw house-sized boulders resting in the middle of crushed teahouses and was approached over and over by villagers pleading for business, offering tea and lodging. She felt she had to help, she said, so she’s launched a crowdsourcing effort at generosity.com. The campaign is intended to direct more tourism to the area by hosting trips in the fall or spring that will include the services of an English-speaking Nepali guide and accommodations such as meals of rice and lentils, vegetables and curry. She’s also striving to raise money for the Langtang Reconstruction and Management Committee, a group of locals whose goal is to get Langtang families out of tents.